We awoke yesterday, Saturday morning, September 29, to witness the first hard frost of the Fall season. Our temperature gauge read 30 degrees. There was frost on the grass and frost on the house and garage roofs. We three Scheckel boys growing up on the Crawford County farm outside of Seneca in the late 1940s and 1950s looked forward to Fall. It was the opening of the squirrel hunting season. Fall is the most enjoyable of seasons, full of sights, sounds, and smells that delight the senses. The skies are pleasant as the humidity of summer is largely behind us, and the white cumulus clouds stand out against the azure blue sky. The sumac has turned bright red. Rabbits, in abundance this year, hasten to their hiding places. Squirrels gather nuts, storing them for the long winter ahead. Butterflies are abundant. We see sandhill cranes feeding in the harvested oats and hay fields. Wooly bear caterpillars are spotted. I stopped to examine a couple of them. They will tell us about the winter ahead. Narrow brown band means a bitter winter ahead. Wide brown band will indicate a mild winter. You can count on it. What’s the verdict for this year? I find a wide band, it’s going to be a balmy winter. No need to travel south this year! A few V shaped flocks of geese are overhead. Maybe some have headed south already. It’s good to get to Missouri and Arkansas before all the good feeding places are taken up, they’re telling each other! And the smells. Fall has a scent all its own. The cornfields emit a certain scent, as do the dried leaves. The winds carry an aroma of a large dairy farm. It’s not exactly a perfume or fragrance, but it does evoke memories of decades past on the Scheckel farm on Oak Grove Ridge near Seneca. The days are getting shorter. It was dark at a little past 7 PM last night. 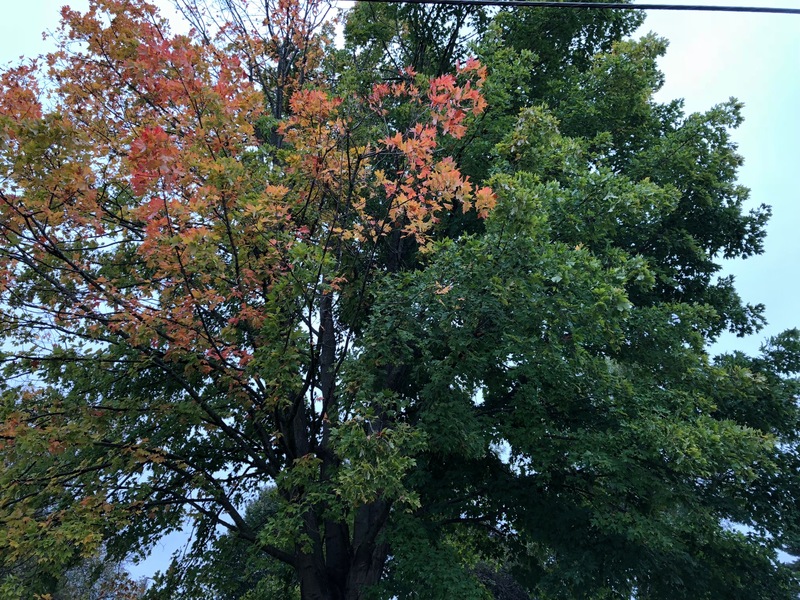 The big maple across from our house is turning color. The leaves on the left have turned to yellows and oranges. The right-hand side remains green. It different each year. Next week is a busy one. We’re heading down to Sugar Creek Bible camp north of Ferryville on Monday, October 1, for a presentation to a group called “Yesterday’s Youth”. The title is Farm Life and the One-Room Country School in the 1940s and 1950s. Tuesday we give a 2-hour science presentation to virtual school students. Catch you down the road. Genesis 2:1 – Thus the heavens and the earth were completed, all in their vast array.